Beautiful villa located on Elba Island with a breathtaking sea view of the Tyrrhenian Sea, surrounded by the Mediterranean scrub, in the shade of tall maritime pines. The house is comfortable , independent and cool inside; it offers privacy and quiet, overlooking the wide gulf of Marina di Campo and its wonderful golden sandy beaches together with the lively village, a well-known tourist resort. The villa has 5 bedrooms, 3 bathrooms, double living room, study , kitchen, laundry room and it is surrounded by a wide private garden completely fenced: it’s the ideal place where you could let your pets move freely and safely. Pets are really welcome. Nearby you can find the most famous and charming beaches on Elba Island, together with the most exciting walks along the trekking trails running across the protected area of the Park of the Tuscan Archipelago. Daily boat excursions leaving from the village pier around Elba coasts and to the other archipelago’s islands. The village and the beach are about 1.3 km. The house is in a panoramic position on top of a short but steep climb: a car is recommended. Owner living nearby. Contact us for information and requests of any kind. A hidden sanctuary on a little slice of heaven! This villa is such a special place! 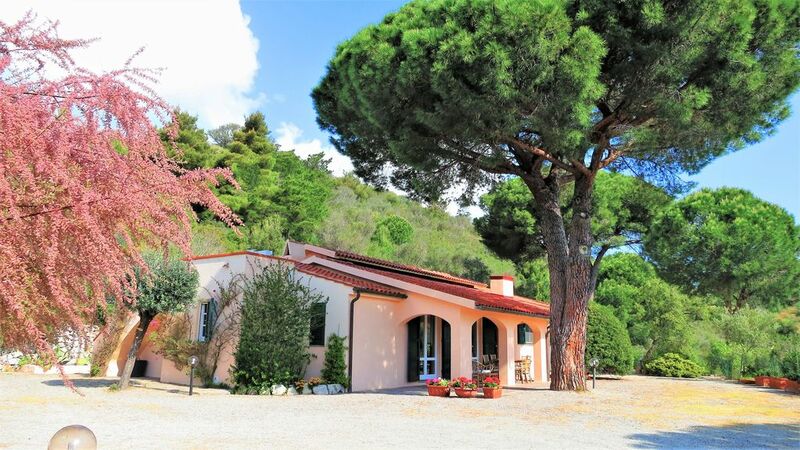 The location is wonderful, with sea views of marina di campo below. As it is set up on a hill, there was a cool breeze in the evening and the outdoor living space was well equipped for entertaining, with a large table and plenty of chairs. The rooms are airy, light and clean and the water pressure in the showers was very good! Alberto and Roberta were very nice and thank you to you both for letting us stay in the beautiful villa. I would recommend this to all of my friends and would love to stay again! Vom Moment der Buchung, über die erste Begegnung bis hin zur Verabschiedung, können wir nur Gutes sagen. Herzlichkeit und Liebe sind zutiefst spürbar. Das Haus ist der perfekte Ort um Glückszeit zu genießen. Wohlige Wärme, liebevoll ausgestattete Räume und eine funktionale Küche. Casa spaziosa e ben arredata, in un'oasi di tranquillità. Bella vista sul golfo. Casa ideale per godere di privacy senza limitazioni di spazio. Posta a 6-700 metri dal mare, vi di arriva in pochi minuti. Proprietari cortesi e disponibili per qualsiasi richiesta. Casa ben arredata e completa di tutti gli elettrodomestici. Da stimmt fast alles, ausser das Wetter, aber dafür kann ja der Vermieter nichts !! Gerade bei schlechtem Wetter macht ein so schönes Feriendomiziel erst richtig Spass. Da kann man auch mal einen Tag gut bei faulenzen über die Runde bringen. Das Haus liegt idyllisch auf einer Anhöhe. Die Unterkunft ist sehr geschmackvoll eingerichtet und super sauber und gepflegt. Ein schönes großes Grundstück mit Blick auf die Stadt und das Meer von der Terrasse aus. Der Empfang durch das Besitzerehepaar war sehr freundlich und sie waren immer telefonisch für uns erreichbar. Auch erhielten wir bei der Ankunft viele gute Tipps über die Insel. Leider gibt es kein WLAN. Thank you for your fine words. Next year we will definitely provide the Internet connection. Die Villa ist genau wie in den Bildern beschrieben sauber, riesig, ideal für Familien oder kleinere Gruppen. Die Zufahrt ist ein bisschen "mit Anlauf steil einen Berg hoch", dafür entschädigt die grandiose Aussicht auf Marina die Campo. Das Meer ist ca. 1,2 km entfernt, das man mit dem Fahrrad in ca. 5 min erreicht. Die Vermieter Roberta und Alberto sind sehr nett und hilfsbereit. Werden nächstes Jahr wahrscheinlich wiederkommen wollen. ARRIVO/PARTENZA: Sabato - Deposito Cauzionale 250 € - Spese di pulizia finale 100 € - Consegna delle chiavi da parte del Proprietario. ARRIVAL/DEPARTURE: Saturday - Security Deposit 250 € - Final cleaning 100 € - Delivery of the keys from the owner.